Last August, Princess Yachts became the first luxury yacht manufacturer to officially collaborate with the Marine Conservation Society, helping the charity to support and sustain marine environments for future generations. Together with the Marine Conservation Society (MCS) and Seabob (CAYAGO AG), the UK’s leading luxury yacht builder has initiated an awareness campaign spearheaded by the production of an illustrated children’s storybook, which aims to highlight the importance of marine conservation to a new audience with proceeds from its sale going directly to the charity. The book, entitled ‘Enid & Her Magic Yacht’, engages with a future generation, appealing to Princess customers who consider family time of primary importance when aboard their yachts. Illustrated by renowned artist Jaume Vilardell, the story teaches compassion and social awareness via an exciting tale of a little girl aboard a superyacht who encounters wonderful sea creatures and saves the day during a volcanic eruption. Additionally, building on a previously successful partnership with renowned high performance water toy specialists CAYAGO AG, the two brands have developed a new “Volcano” limited edition F5 S Seabob, using the imaginative artwork from the children’s book to create a unique product that can be enjoyed by all the family, while further supporting the invaluable work conducted by MCS. Alongside this campaign Princess has established an understanding with MCS to ensure only sustainable seafood is served at all of their official events, and Princess is committed to working closely with the charity to further develop its current standing as a conscientious and quality assured manufacturer. ‘Enid & Her Magic Yacht’ is available online at www.princessyachts.com or from online retailer Amazon with all proceeds going to MCS. The limited edition Seabob F5 S “Volcano” is available through Princess distributors or via www.seabob.com. For more information on the work of the Marine Conservation Society and to learn about further ways to support the charity and play a role in environmental conservation visit www.mcsuk.org. Founded in 2007, CAYAGO AG is the technology specialist for the development and production of exclusive and innovative water sport vehicles with its headquarters in Stuttgart, Germany. In the production facility located in Bad Salzuflen, the world’s fastest water sled is manufactured with the highest level of precision: Sabob – a high-performance sea toy made in Germany. 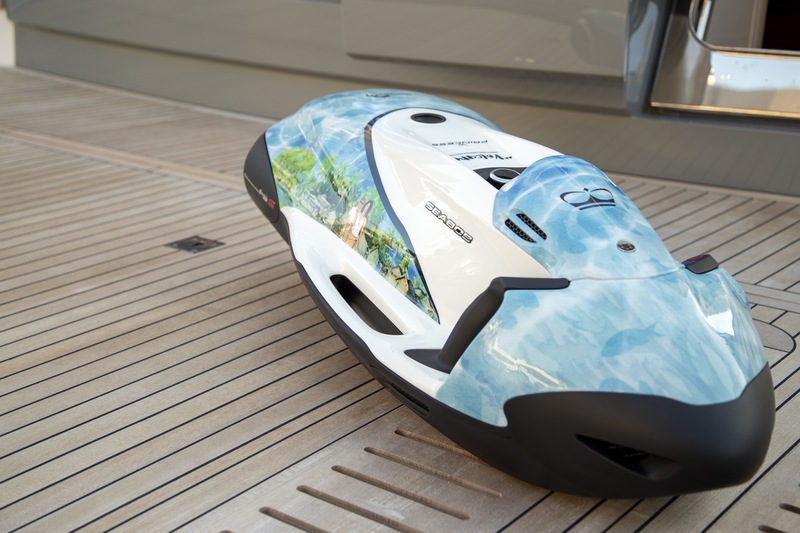 The Seabob was developed in line with the brand’s claim “luxury sea toys, to satisfy customers’ highest demands. True to the company’s philosophy “High-Performance Technology”, quality products are continually being developed further with innovation and great passion and fulfill the highest demands placed upon technology and design.